I've been looking around a bit for patterns that I think would be easier, if not easy, for beginners. Being a beginner at sewing is a delicate thing: you want to make something that won't frustrate you beyond the bounds of human tolerance, but at the same time, you want to make something that you actually WANT to wear. As I said, delicate. This is one of those patterns that I think would be good for a beginner (it's up right now at Miss Helene's.) It's interesting without being complicated. If I were a beginning sewist making this for the first time, I'd do it in a big wild floral; that would make it easier to hide any bobbles in that front skirt seam. (A very textured fabric, like piqué, might work for that, too.) If I were feeling brave, I'd do a contrasting/coordinating yoke and pockets, as seen here. Maybe I'd do the yoke in black or white, if I were worried about the possibility of a bright unflattering color near my face (which, obviously, I never am, but I hear tell some people are). What other criteria would you suggest for "beginner" vintage patterns? I just made a dress from an Easy McCall’s pattern that’s – gasp – lined!So I guess I would say don’t skip a pattern just because there’s another layer of fabric underneath the main one. Even if you’re a beginner sewist. For my pattern, I just basically sewed two dresses and with a stitching, made them one. 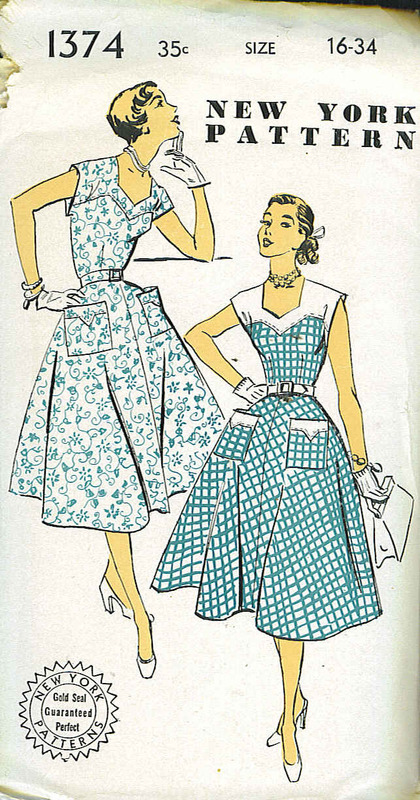 Erin, I have thousands of 1940s to 60s patterns and I love the ones with only 3-4 pieces. Now that should be an easy component and less frustrating if you have only minimal pieces. Many of the early vintage patterns were easy, sew easy, beginner, 3 main pieces, etc. I think that pattern has one trick part for beginners, though. I may be guessing wrong about the construction, but fitting the upper bodice to the lower bodice looks troublesome. After sewing for years, I still have trouble fitting the inner curve into the outer curve. I would suggest patterns where the seams are made on pieces with essentially the same shape (such as matching a front bodice to a back bodice).Cute dress, though! If only this post had come out a couple of weeks ago! After reading your blog for a while I became inspired and had to sew. I probably did a lot of things wrong for a first-time dressmaker: set in sleeves, sewing darts into super slinky fabric; not thinking about fabric layout…and on and on…I’m not discouraged though. I enjoy reading your blog for any tips and hint you may pass on. For beginners, I’d avoid patterns with buttons! Not that the button iteself is hard, but button holes can be difficult (even when the machine is making them). My first skirt with buttons required me to rip out the first button hole several times, even though I had made several practice ones on a remnant piece. I’d also suggest avoiding Vogue patterns, even if marked “Easy/Very Easy.” I think ease depends a lot on the pattern company. My very first piece was a Butterick vintage inspired dress, and it was absolutely a dream to work with! Had it been a different pattern or company, I may have been very frustrated and never finished the piece. Beware the side zip! They often turn up in vintage dresses. Once you’ve done a few they’re not so bad, but the instructions on the package read like something translated (inexpertly) from the Chinese. If you have an experienced sewist at your elbow, ask him/her for a demonstration: much better way to learn. I’ve only just completed my second project, and I’m trying to decide on my third – I’m afraid of buttonholes! My first project was Butterick’s 6015 Walk-Away Dress – the perfect beginning project. About 10 years ago, I started tracing my patterns off onto 36″ wide rolls of vellum paper — any tracing paper will work — with a Sharpie marker. What a difference! You really get to know the pattern better; you are much better able to visualize the way the pieces work together, and you don’t destroy the original pattern. All the better to later sell it on Ebay! Definitely keep an eye out for the closures – be it a zipper or buttons. Either can be troublesome, but with patience (hard, for not only new sewers, but those of us who have sewn for a long time, too!) and good instructions, the results can be great. Regarding insturctions look for patterns with simple, but detailed instructions. It may be difficult for a beginner to understand some of the more complicated sewing techniques. They might not appreciate the instructions to “Insert zipper according to package instructions.” found in many vintage patterns, either. Especially if the zipper has neither! Although I haven’t made the Walkaway Dress, I would agree with Helen that it’s a great beginner project… I’ve been eyeing it up myself. I wanted to point out that although you can find vintage copies of this pattern–see here for a listing–it tends too be expensive (due to its history, I guess), it’s still in print so you can get a brand new one for much less. Heh, in looking that up I found your previous post on that very pattern! Avoid buttons in lieu of zippers. Multi-piece bodices that are fitted are really for someone with some experience. Fabric selection is really crucial I think for a successful project – I still don’t like working with stretchy knits and I have tons of experience. Self-facings are easier than separate facings. I would also avoid bias designs, and those with many layers of gathers. The fewer the pattern pieces the better. Words to live by, even now. Though I can and do break all these “rules”, I’m an old hand, yet still sometimes stumble. That’s what seam-rippers are for. Oh, and always buying a bit more fabric than you need never hurts. If all else fails, quilt. About Vogue “very easy,” I have to agree that may well mean “not entirely impossible.” I love Vogue patterns; they fit me well and often have very good instructions. But my return to sewing after many years away was a Vogue dress that had set-in sleeves, a long back zipper, a lot of darts, and a bodice/skirt join that featured (gasp) a sharp inverted point. It was labeled “very easy.” So funny, the Vogue people. I made it worse by picking poly charmeuse. So my advice to beginners: use cotton/blend fabric! As a person of size (fat, size 24 on a good day), I just don’t bother with vintage patterns, thinking I’ll never find my size. I look to them for concept ideas then find modern ones that can be altered to look like what I want. After teaching my girls a little “how to sew” (doll blankets, etc. ), I sent them to 4H Sewing Club. The first beginner project is a skirt, followed by a sundress or jumper, followed by a 2 piece outfit with sleeves. That’s the progression I’d advise for a beginner. And: The fewer pieces the better, until you get the hang of it! I say avoid anything stretchy, at least until you get to know your sewing machine. Quilting cottons are nice, the $8 variety have served me well in the past. Diva Jean – got to Born to Late – she specializes in plus size patterns and she is so nice. Most of her patterns are $7-$10. I agree the Butterick walk-a-way is GREAT for beginners. I find Simplicity to have very clear directions. I’d suggest starting with a skirt for a bare beginner. It gives you a chance to get to know the sewing machine without using as much time or fabric. When working with children, however, I have found a love for Simplicity’s 9822, the poncho in their Sewing for Dummies line. It works really well in this season where it’s not quite cold enough for (or they’re really tired of) the heavy winter coat, but it’s not yet warm enough for no jacket at all. Go grab it before your local store throws it out, I know it was still availble this winter, though it’s no longer on simplicity’s site. I would say the perfect beginner project is a skirt, as someone else mentioned. It is much more instant-gratification than a dress, and the investment is less. Also, short zippers tend to turn out better for me.For a dress, a wrap dress is hard to beat. No buttonholes or zippers, and the wrap style means less fitting is necessary.Everyone is warning against buttonholes, but my experience was that I dreaded them, having heard such bad things. I avoided them for so long, and in the end I found I prefer doing buttonholes to inserting zippers. So try something with a few buttonholes before you get too scared. A good, not too fitted skirt is indeed a good first project, as well as PJ pants. I also recommend tote bags to new sewers (fairly big for a purse, can carry lots of items in it, doesn’t require much fabric, open at the top, an under 2 hours project for most beginners). I would say that a tote bag is not a sufficient to see is you enjoy sewing or not. But it is a great confidence-booster. As for zippers, I actually find invisible zippers WAY easier (and more attractive) than regular zippers, but that’s just me. Just a couple comments:I wanted to warn first-time sewers that in regards to vintage patterns it isn’t uncommon to have to alter the bodice here and there to have the desired fit. The standard body over the years has changed quite a bit.Also, in regards to the Walk Around Dress…it is a quick and easy sew but be warned that if you have a small bust, it isn’t the pattern for you. The heavy circle skirt in the back will weigh down the dress and move the shoulder seams. As a result the front is completely mis-aligned and ill-fitting. I’ve had several friends who have the same slight body shape make this pattern and the result was the same. All the raving reviews on the web regarding this pattern are from sewers who have the hour-glass figure that this pattern requires to keep everything in it’s place. Just something to think about. I’d recommend one of these dresses as beginner patterns, this first one (yes, its an easy vogue), has a similar shape to Erin’s but doesn’t have the upper/lower bodice difficulty. Also, you’ll get all the lines, markings, and finished measurements for multiple sizes, which will make fitting easier. I’ve been sewing for a long time and I’m having a lot of trouble adjusting to vingate patterns, mainly the fitting but also the instructions are not very detailed. http://www.voguepatterns.com/item/V7871.htm?tab=very_easy_vogue_dresses_br_includes_koko_beall_designer&page=5http://www.butterick.com/item/B4957.htm?tab=yes_its_easy_see_sew&page=4Neither of these have pockets, but if you check out the Burda website that Erin has a link to, there are great directions for drafting and adding them. If you are just learning to sew, you might want to try Kwik Sew patterns. Granted, you probably won’t find a pattern for a vintage-style shirtwaist dress with a big poofy skirt, but you will find good instructions, including techniques that you can use on many other garments. I’ve always like their books, which come with a basic set of patterns. The book tells you how to adapt or modify the basic pattern to create different styling options – information that can be applied to any pattern you want to modify. The construction techniques can be applied to anything you want to sew.http://www.kwiksew.com/CMCThe illustrations of the garment designs on these patterns often do not do them justice, but don’t let that keep you from at least trying a Kwik Sew pattern. They have an entire section of “learning to sew” patterns. @rachelmm: I have a Bust of No Mean Size and made a walkaway dress this week. I had the same problem you are describing- the heavy full circle skirt pulled and then the front piece would ruck up.I fiddled around with it for a while and realized a couple of things:1) Wear a slip. Really! Wear a slip. It helps with the front’s tendency to ride.2) I am normal-to-short waisted, and the dress pattern’s waist was waaay too long. That dresses back snaps were closing over my tail bone, not at my waist; the front button was similarly almost to my navel.3) The back was longer than the front to begin with.It was too late to go shorten the pattern in the waist, obviously. So. I 1) Picked out the seam binding, and pulled the back shoulders up two inches. This brought the front fastening up to my waist.2) Checked my darts to make sure the really did fit, and pulled them in even more than I had in the beginning. this pulled the waist snaps up to my waist, as well.This has given the dress more shape and- oh happy day- brought the skirt up to a more flattering place just below my knee.SO! Walkaway Dress Pattern As Is: A piece of cake to sew; it took me a couple of hours. But you may be paying the price of constant dress adjustment.Walkaway Dress With Alterations: Much Better, if somewhat more fiddly.Walkaway Dress If I’d Really Checked The Fit Of The Darts and Waist Length By Using My Dress A Day Tape Measure: Priceless. PS: The Walkaway Fitting Lesson For Me: vintage dress patterns are more fitted. I am a 21st c. girl, and wear things more loosely (or cheaply) cut, and have everyday clothes like jeans ride on the high hips, not my waist. This dress needs to be fitted with waist marks where you waist really is. It will help anchor it so it doesn’t slide around. Bad: easing seams, zippers, topstitching.Also, to avoid buttonholes, thread chains would be perfect for the beginner. My mother started me on library bags and other simple items with straight seams. Then she’d let me tackle specific stages in clothes she was making for me. But my first “solo” project was Silas the Sheep. A 40cm high stuffed animal (a Suffolk sheep with the black nose), fully dressed. So in the course of making Silas I had to work with a range of fabrics (calico, felt, fur, etc. ), and I had to cut and piece together pants, jacket (with set in sleeves) and a waistcoat (vest), all on a miniature scale. Soon after I made “real” dresses for large dolls (a baby doll and a girl doll). When I came to make clothing for real people, I’d already been introduced to the basic principles and pattern shapes, albeit in miniature.Not a bad way to start if you are very young, as I was, or have young people in your life who will appreciate toys and dolls clothes. Just not too miniature though (no Barbie dolls) and make sure that the clothing is cut and constructed in the same manner as the real thing. PS. My mother also used Burda patterns from time to time. This was in the pre-English edition days. My big sister, who was studying German, had the task of translating the instructions and I, who was small and nimble and didn’t mind crawling around on the floor, had the task of tracing patterns and then laying them out. My sister’s sewing knowledge was reinforced and I learned an awful lot about pattern shapes and efficient use of fabric as well as matching stripes, checks etc. long before I tried to make something of my own. (The aforementioned Silas had a plaid suit – I was an old hand at matching checks by then!) And as Maria Montessori would say, a child helping out will often be naturally inclined to be far more diligent about the detail (matching a pattern, for example) and is far more likely to take the necessary time for perfection than an adult. I would do that pattern in one of those retro Western prints, with a solid-colored yoke and pocket facings, decorated with applique or embroidery. June Cleaver goes Rose Maddox.And, yes, I’d wear it with boots. You can do that here in Texas.The first dress I made was a 1947 wrap housedress with curved shoulder seams and small pleats in the bodice front, below the shoulder seams. I’d never done curved seams or little pleats before, and I decided that it just HAD to have contrast piping in the seams. Oh, and I picked a unidirectional print. I think the only reason it came out that well was because I didn’t realize I should have been intimidated by it. The Walk-a-way dress does the slidey thing on the ample busted too– turst me! But it is easy to make…and wearing a slip does help immensely. Of course everyone “back in the day” wore a slip. Now it’s nearly impossibe to find one! A seamstress, dahling. That is what I would recommend. Ciao! In case anyone missed it, something Erin said in an earlier post was that if you’ve learned to drive or can follow a recipe, you can also learn to sew. A sewer’s technique will improve over time, but if you can be patient and follow basic directions, sewing skills are not out of reach for practically anyone. I think that’s very encouraging advice! What I’m going to do is Xerox each step of my pattern’s directions and blow them up to single page size, to keep in a binder for notations of reminders as to what worked…because I like the idea of making a good dress that ends up being flattering in several colors. For instance, I’d love the dress pictured above in both bright blue with white, AND in pink gingham. I would like to further emphasize something Nora mentioned, regarding picking pattern shapes:Working with simple patterns to start is good. Don’t pick an A-line shaped pattern if you don’t have an A-line shape! If you have an A-line shape, aka “pear,” you will look good in an A-line dress. If you are a ruler, or straight-figured, and wear lots of petticoats, you can also wear an A-line dress, but you will be better off with the:Shift dress. The shift dress was meant for the rulers amongst us; hail, shift-dress-wearers! If you are an hourglass, but not too extreme, you may look OK if you fit the shift dress carefully. If you are an hourglass, you will NOT look OK in the above-mentioned A-line. You are better off with one of those “easy” dresses with a couple of darted pieces for the top, and a gored skirt or circle skirt for the bottom.I would also suggest avoiding stretchy or slippery fabric. If you have one of those vintage patterns with no markings on the pieces, I would suggest copying the pieces and then marking them appropriately before you cut them out; it will make life so much easier for you!